A tasty twist on boneless pork chops! A tasty twist on boneless pork chops! 1. Rinse and slice potatoes into bite-size chunks. 2. Mix olive oil and Ranch seasoning packet in a bowl. 3. Dip pork chops in olive oil mix to coat both sides and place in a baking dish. 4. Put potatoes into olive oil mix, shake to coat, and place around pork chops. 5. Place onion rings over the chops and potatoes. 6. Sprinkle pimentos over the top. 7. Add water and cover dish. 8. 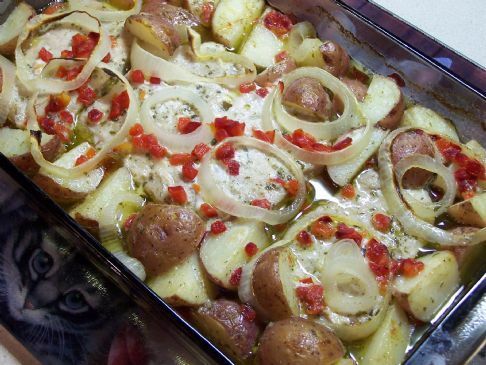 Bake at 350* for 40 - 45 minutes or until chops are cooked through and potatoes are tender inside. I removed the cover after about 30 minutes to allow the potatoes to get a little crispy.